I just knew it when I agreed to trot over to Northern Ireland at short notice to do a check flight for the very nice Simon Calder and, typically, it happened. 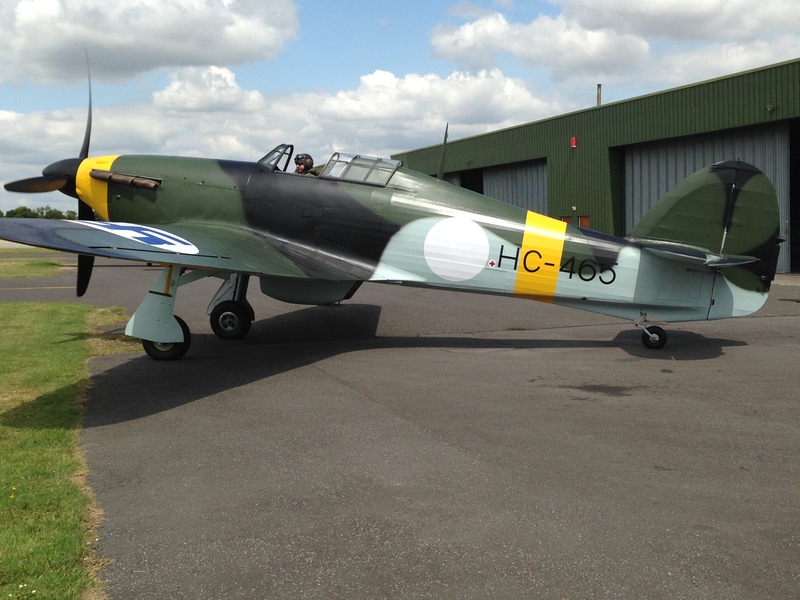 I missed out on seeing Phil Lawton’s finally finished Hurricane take to the skies over Thruxton and later, or so we understand, most of the New Forest and up as far as the Savernake Forest. Never mind, having dropped me at Heathrow to suffer Aer Lingus Jane wobbled down to Thruxton in the old person’s car and met up with Phil’s brother Jeff and Geoff Grimes to watch the Hurricane being put through its paces by test pilot Stuart Goldspink who, apart from flying passenger jets, has flown just about every type of old and rusty aeroplane ever built. 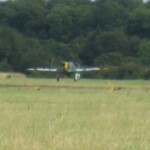 As she arrived it was already in the circuit and on finals. Her heart sank. Not to worry, she was soon out of the noddy car phone clicking away (or whatever telephones do these days). 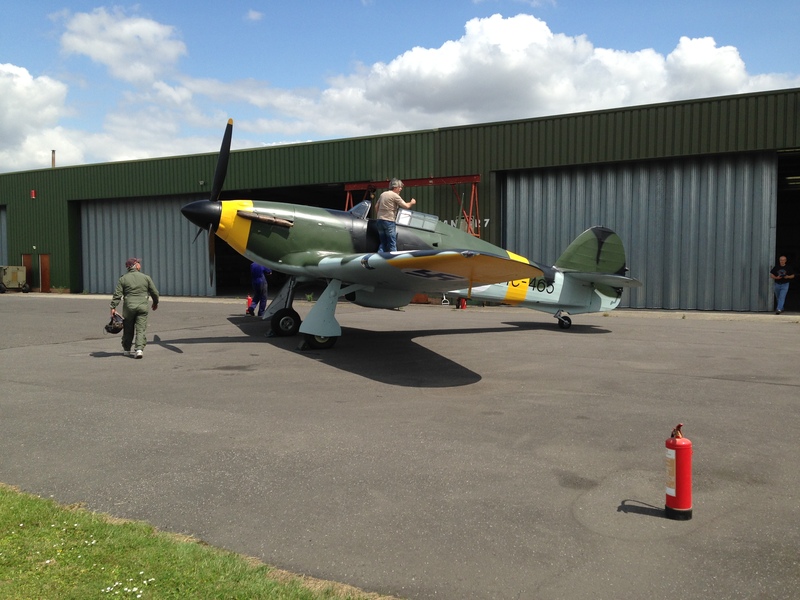 By the time she got round to the hangar the Hurricane was already taxiing in, now that’s not simple to say. First impressions were very favourable but there were a few problems, as you would expect, including a bit of concern with the undercarriage warning lights indicating that it didn’t seem to be locking up properly on one side and the canopy wouldn’t stay closed. 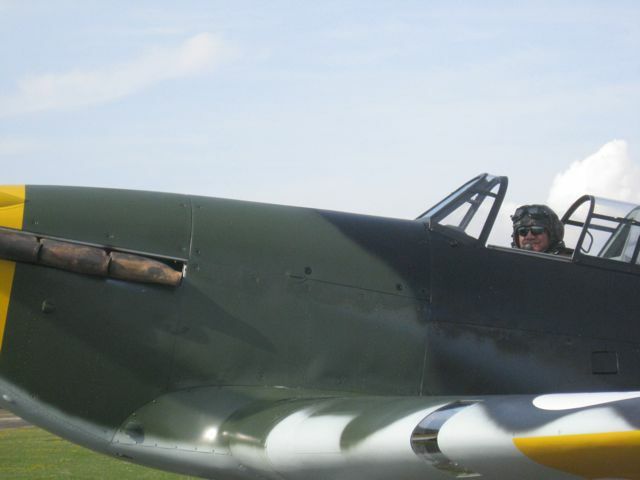 Stuart explained that all the Hurricanes he’d ever flown did that! It was decided that an hour or so should sort the undercarriage problem, or at least show what the problem was, so it looked like the old girl would be up again for another sortie. Stuart the Pilot declared he was going to have a cuppa so Jeff , Jane and the other Geoff decided they’d head for the airfield café that lives under the old original, but now enlarged, Second World War RAF Thruxton control tower. Team Spotters decided that driving to the café, which in fairness is a fair trek from the Hurricane Hangar, would be best and passed the main man apparently heading the same way, not to his car and thermos as they had thought, so being kindly souls they gave him a lift and were rewarded by a most enlightening hour of talk of old aeroplanes and something of his varied career flying most of the UK’s Spitfire and Hurricane’s including the RAF Memorial Flight examples, amongst others. He was full of praise for Phil’s Hurricane which was reassuring. 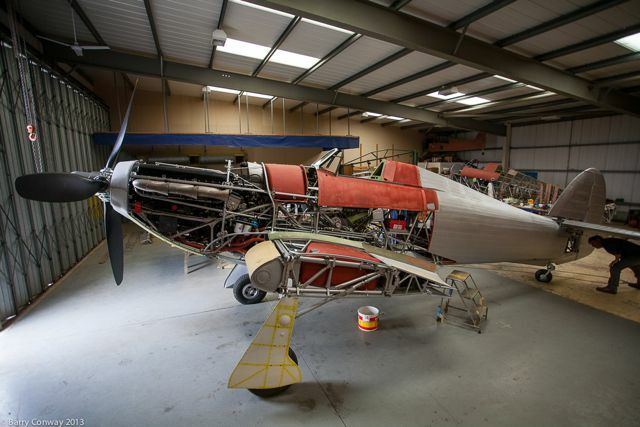 Meanwhile, back in the hangar, Phil and his team beavered away and managed to sort the problem with the undercarriage, or at least determined that the undercarriage was working but not engaging properly into the locking catch. This was put down to the drag caused by the undercarriage cover as the wheel retracted. Marks showed it was only out by a fraction of an inch so a guide was fitted which ought to help guide the pin into the catch as it came up. As for the canopy, there seemed nothing obvious and as it wasn’t deemed an unusual trait it could wait for another day. Now refreshed Stuart completed another walk round and the Merlin crackled back into life firing up on the second blade settling down to a rather lovely rumble. Back onto the grass and a with short run the Hurricane climbed smoothly back into the air with the minimum of effort and with both undercarriage legs nestled into their bays and greens showing she was turning steeply out across the open countryside. 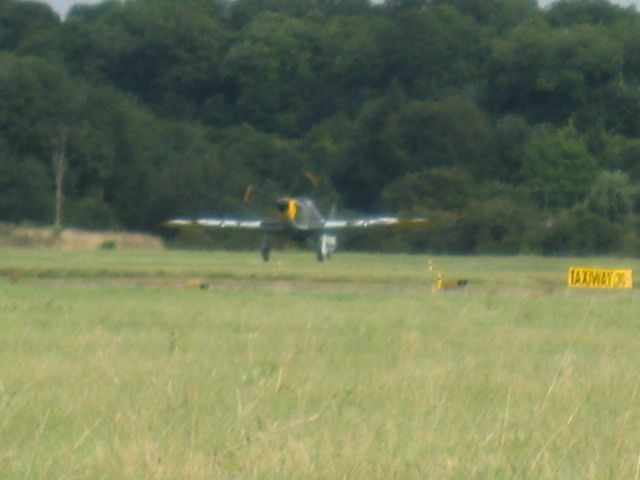 Seconds later Stuart did a classic flypast pulling up hard as he crossed the old peri track which now forms part of the Thruxton Race Circuit, something that would have been a familiar sight back in 1942 when Hurricanes operated from the airfield in earnest. A couple more passes, steep long curving turns, tight heavily banked turns and soaring full power climbs before swooping round and returning to flash across the airfield before climbing away and becoming a small dot on the horizon and then disappearing into the distance. Ten minutes passed then a quarter of an hour. General banter turned to chatter and then as time wore on and there was no sight or sound of a Hurricane Phil clearly started wondering if his lovely aeroplane that had taken so long to rebuild was OK. Concerns were raised that Stuart had got lost, “Thruxton is hard to find from air,” explained Phil. The concensus was though that Stuart was clearly having a ball and would be back soon. Phil remained unconvinced. Eventually the dot, first spotted by Phil, fast grew into a Hurricane which swept, swastikas and all, over the spectators, joined the circuit and touched down perfectly on the grass and taxied proudly in. Phil recommenced breathing. The mighty Merlin idled for a few moments then silence descended. Stuart the Pilot clambered out all smiles and thumbs up. It was time for paperwork and a debrief. 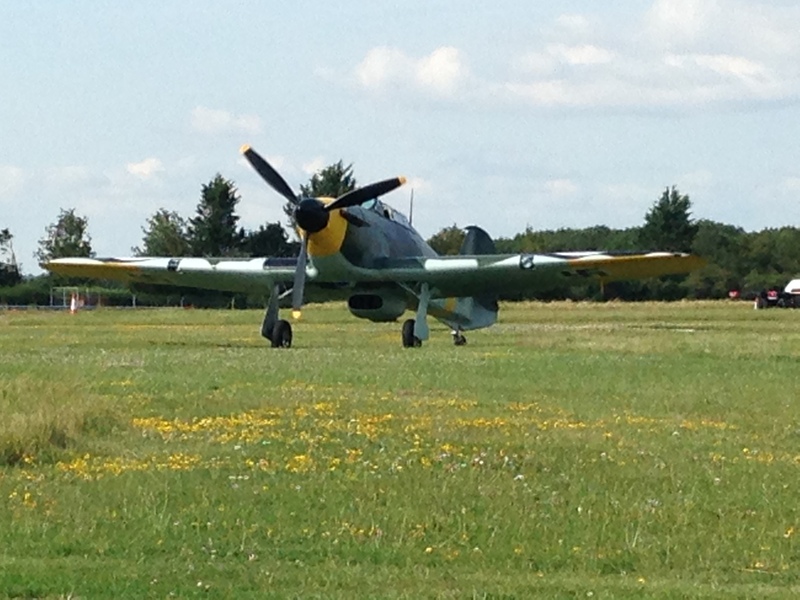 He told Phil it flew extremely well and he’d taken it for a bit of a buzz over the New Forest and up to the Savernake and pulled lots of ‘Gs’ and it had performed very well indeed. In Ireland we were also gazing skywards, scratching our heads and waiting for some rainy squally weather to pass ready for a check flight. I called Jane who, amongst the babble of excited ‘brilliants’ followed by ‘fantastics’ in the background eventually told me all had gone well. We decided to celebrate later with a Guinness or two in the Market Tavern. That was that then. 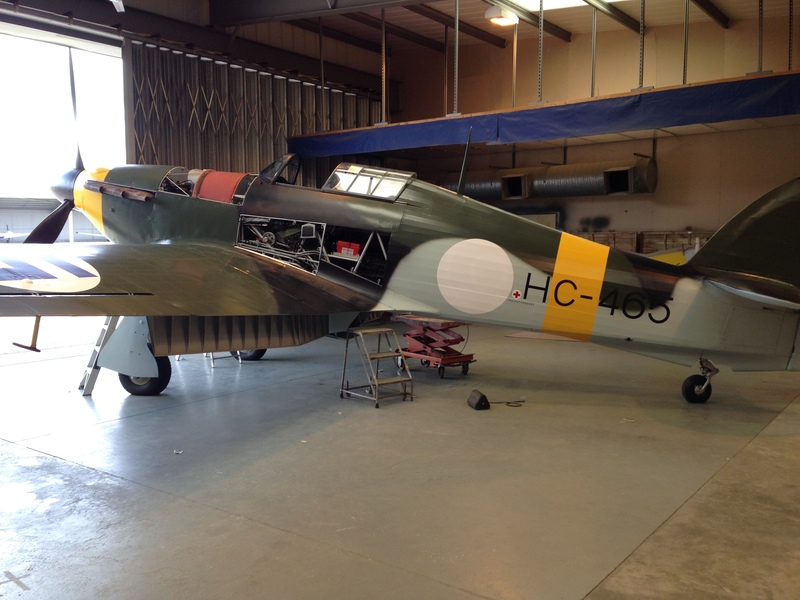 After countless hours of labour, problems sourcing parts and complying with a daunting list of officialdom the Hurricane that had been recovered from Canada following a bit of night time aerobatics was now back in the air and almost signed off. There were a few niggles to sort and no doubt a pile of maintenance that will now be carried out just to make sure everything is still where it should be but that is it. Next stop Finland. It was a proud moment for Phil but the job had now only really begun. He was going to have to learn how to fly it and there isn’t a second seat in a Hurricane. Stuart assured him that it wasn’t much different to the Harvard (Texan actually) although the landing speed would be a bit higher, flaps and gear down around 140knots, touchdown could be accomplished at 80 knots. That was that. It was a pretty basic lesson. 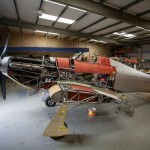 A few days later they’d sorted the canopy problem and he was airborne in it. We arranged to meet up towards the following weekend when he hoped to be taking it up again. 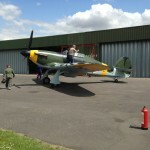 Arriving at Thruxton all was quiet and it was clear that no flying would be taking place. 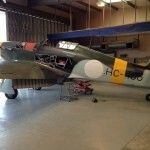 Phil quickly explained that there were still a few things to sort and that the Finnish markings to the fuselage along with re-sizing the wing markings had just been finished. Never mind, we got the chance to see it in its final Finnish colours. We got to chatting about his first flight in it and it soon became clear that Stuart’s briefing did lack specifics. 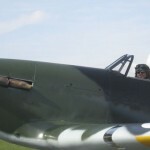 The main things that stuck in Phil’s mind was the sheer power of thing, the noise and the huge torque effect as a result of the in-line Merlin engine as opposed to the radial of the Texan. 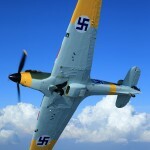 “Being told it was like flying the Texan was so far from reality that it was not really of any relevance. Then there was the noise. I had no idea how noisy it was going to be and when I opened the throttle I really didn't know if it was supposed to sound like that. Then there was the torque which meant that loads of rudder was needed just to keep it going straight. I hit a bit of a rut on the takeoff and sort of became airborne before I knew I had. It was amazing. The effort of raising the undercarriage also meant I involuntarily exterted lateral pressure on the joystick causing a wing to drop. I missed a heart beat there to.” Clearly then the stories of how easy the Hurricane was to fly were not altogether correct. It was of course all relevant. 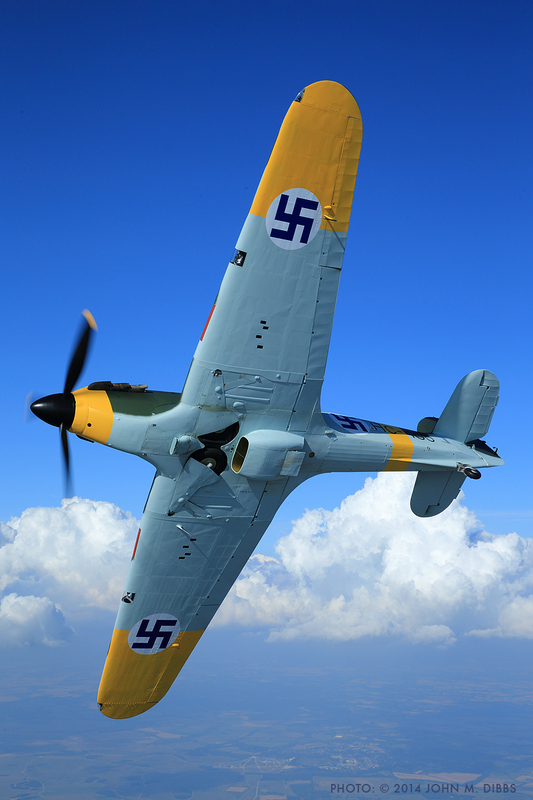 What you have to take onboard is that the pilots were trained up on things like Tiger Moths, progressed to Harvards and then went straight onto Hurricanes. It was the norm. There was no mileposts, no intermediate place or real experience gained on other types and as many of the pilots had never flown anything until they joined up they had nothing to compare it with. Phil explained “Once in the air it was fine but let the speed drop below 140 knots it flew like a pig and was wallowing around. Put the wheels and flaps down and it drops out of the sky. It doesn’t land at 80 knots. 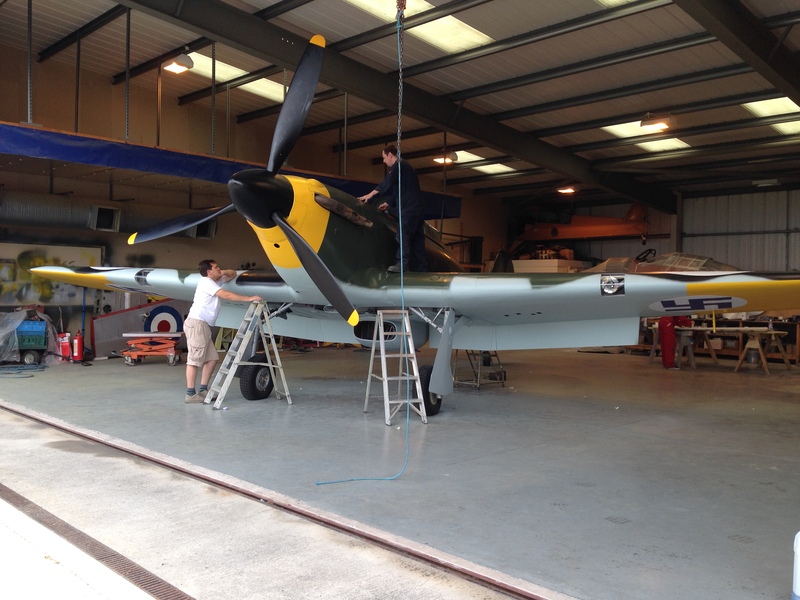 At 80 knots it arrives on the ground.” He admitted that he had really thought that clocking up the hours in his Texan would be enough for him to get to grips with the Hurricane quite quickly. This though was not the case and he had bravely decided that there was simply not enough time for him to get up to speed and display the aircraft at the planned Finnish Air Shows so had recruited his friendly instructor Clive to do the deed. A bold decision, however they still needed to get it to Finland. 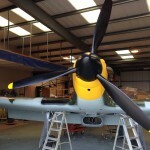 We got to talking about the restoration itself and one of the biggest problems apart from the obvious fact that it was a large pile of bits when they started, sourcing a suitable spinner for the prop had been almost impossible. All the ones they’d looked at didn’t quite fit and as they knew the nose panels were all original they were loath to chop them about to give the appearance that spinner and nose were as one. Then finally they found an original spinner. 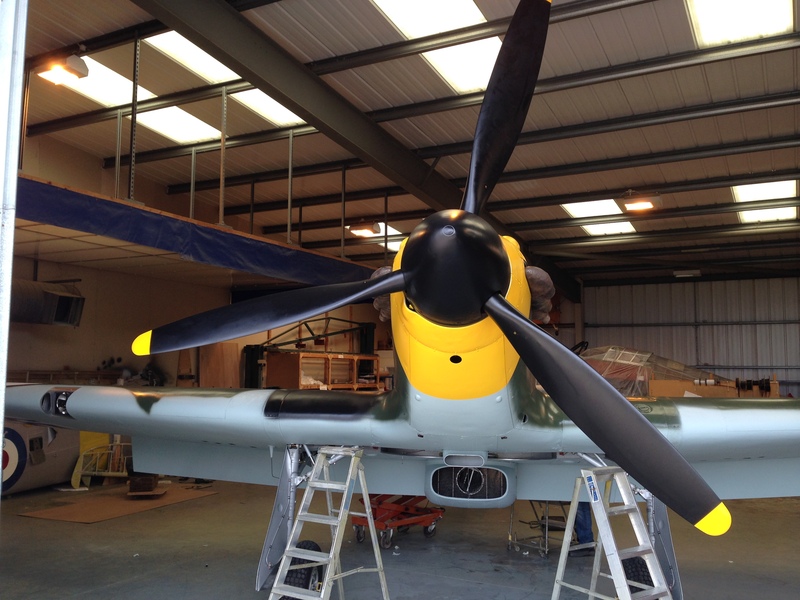 There was a bit of fun and games getting it to fit the prop but the end result is as good as it gets and it now has that quaint slightly pointy look that is so Hurricane. Now you can’t just jump in a Hurricane and fly it across Europe without permits and permissions. It is a UK registered Annex II aircraft so requires the agreement of the country you need to overfly. This translates into completing forms and paying money to the countries involved. Then there are the markings. It had become apparent that they may not even manage to be in Finland in time to participate in the Airshows however we learnt a few days ago that the Permit to Fly had been issued so that was one hurdle out of the way. The Hurricane will fly for around an hour and half on full tanks which equates to 35-40 gallons an hour which doesn’t give a huge range if you intend to err on the side of caution which obviously is the case. The plans are that she will fly in formation with the Texan in a series of hops most likely with the Texan playing catch up as there was no way that it could keep up with the Hurricane. Flat out the Texan manages about 140 knots but the Hurricane is really quite unpleasant at that gait and minimum speed for it would be 160 knots. A series of flights are planned to work out the true fuel consumption against speed. First leg would be to Lydd, then onto Texall in the Netherlands moving onto Flensburg-Schaferhaus in Germany. From there they will route past Malmo (just in case) in Sweden, landing at Ronneby also in Sweden followed by Skavasta (Stockholm) then on to the home run. Final legs will be to Mariehamn Airport on home turf in Finland followed by a jog down to the final destination, Malmi outside Helsinki ready for the Finnish International Airshow, providing of course the overflight permissions are issued. 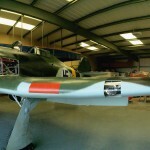 Remember that under the stage paint is an aircraft painted up in silver South African Air Force colours? 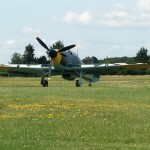 Well in 1942 RAF Thruxton was home to 225 squadron. 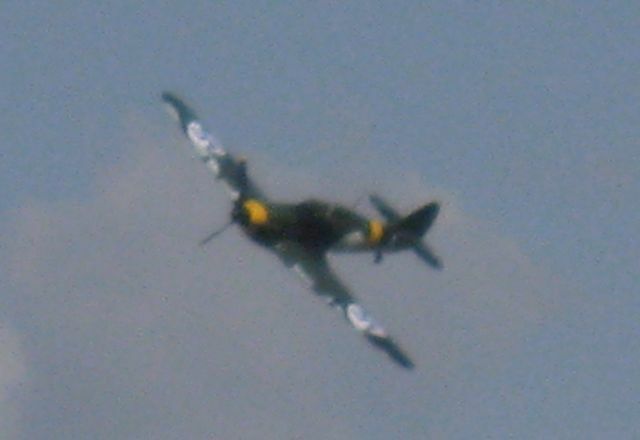 They were first equipped with Lysanders before getting Hurricanes and later Mustangs and Spitfires which they operated in the role of Tactical Reconniassance. In September 1942 they headed for North Africa taking part in the Desert War. 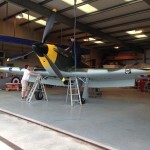 The Hurricanes were replaced by Spitfires so there is every possibility that some of their old and tired Hurricanes may have ended up in South Africa. This story just keeps getting better. Phil’s done something that few have managed in recent years and survived. Hats off to him. As brother Jeff said "He's flown the schoolboy dream and survived". What will be a lot better is that I do actually get to see it airborne but for now I’m just really grateful to have seen its slow restoration to flying condition. 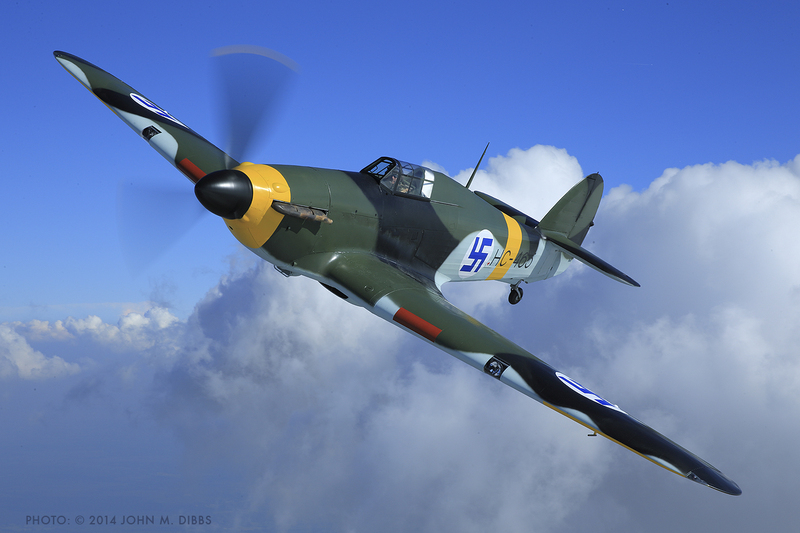 Photos courtesy Jane, Jeff Lawton and John Dibbs. No thanks to Geoff Grimes whose best picture was a onesee or selfee thing! 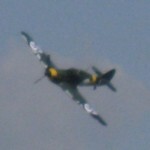 To view the pictures in a larger format, especially the air to air shots, please click on the piccie. 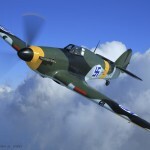 http://www.platinumfighters.com/#!hurricane-xii/c6y6 Now here’s a thing you don’t see very often, a Hurricane ‘for sale’.